The regeneration of the former Dinnington colliery is ramping up again with Trebor Developments, working in conjunction with its strategic partner Hillwood, acquiring a speculative development site at the Rotherham site. The partnership has purchased a five acre site for an undisclosed sum at the prominent 31 East site located less than 2.5 miles from Junction 31, of the M1, near Rotherham. A single, speculative, 83,000 sq ft industrial unit will be developed and will be available in first half of 2019 and promoted as "Atomic" 31 East. Bob Tattrie, managing partner of Trebor Developments said: "We are delighted to secure this further site and will bring the speculative development forward on our fast track basis. A planning application has been submitted. The unit will be available to lease or purchase and can meet local or regional occupier needs in a size range not readily available in the location." The acquisition represents the second between the partners following the announcement in March at MIPIM that Trebor had entered into a long term strategic partnership with Hillwood to undertake industrial and logistics developments across the UK. Trebor Developments LLP was formed in 2008 by Bob Tattrie, formerly managing director of Alfred McAlpine Developments. 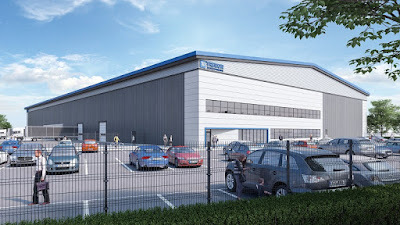 It has been one of the most active speculative developers of industrial and logistics real estate across the United Kingdom, carrying out a range of schemes with a focus on those that range between 30,000 and 300,000 square feet. Hillwood is a leading American based commercial real estate investor and developer with offices in the United States, Germany, and Poland. Active in Europe since 2013, the Perot company anticipates investing £400m in industrial and logistics across the United Kingdom over the next two years. Trebor/Hillwood are advised by agents at CBRE (Leeds), CPP (Sheffield) and Knight Frank (Sheffield). Rothbiz reported earlier this month that a planning application had been submitted for a commercial development on part of the 31 East site. The 44 acre site on Todwick Road, adjacent to the existing 45 acre Dinnington Business Park, already has outline planning consent. Local specialist developer, St Paul's Developments agreed in 2015 with the Homes and Communities Agency (now called Homes England) to create a 750,000 sq ft logistics hub and the site was granted Enterprise Zone status. The latest plans are from another local specialist developer, E V Waddington Ltd, and include creating a speculative development on around 12 acres of land off Todwick Road. Rothbiz has also reported on the £18m investment from United Caps who are progressing plans for an initial facility at 31 East that will be 54,000 sq ft, with an option to expand to 215,000 sq ft as business growth demands. Can't fault the good news about the developments at Dinnington. The only thing is - with the extra people being employed, the road to/from the A57 is going to get really busy at peak times.